I know that Christmas has already reared its beautifully snowy head around most of the US. In fact, the MORNING after Halloween, I went to Target to see what sort of Halloween candy wasn't picked over yet. To my complete surprise, not only had the Halloween section been ravaged of everything other than pretzel sticks, all but one aisle had already been transformed to Christmas-mode. Full blown Christmas mode. Let's pay tribute to Halloween's memory tonight with China Glaze's Halloween 2017 collection, Happily Never After. The theme is a little more "evil queen" and a little less "gloom and doom", but the shades are a little spooky when they're put together in this 6-piece collection. You could make an argument for some as winter colors. I was stuck for ideas the night I did the nail art for Happily Never After. 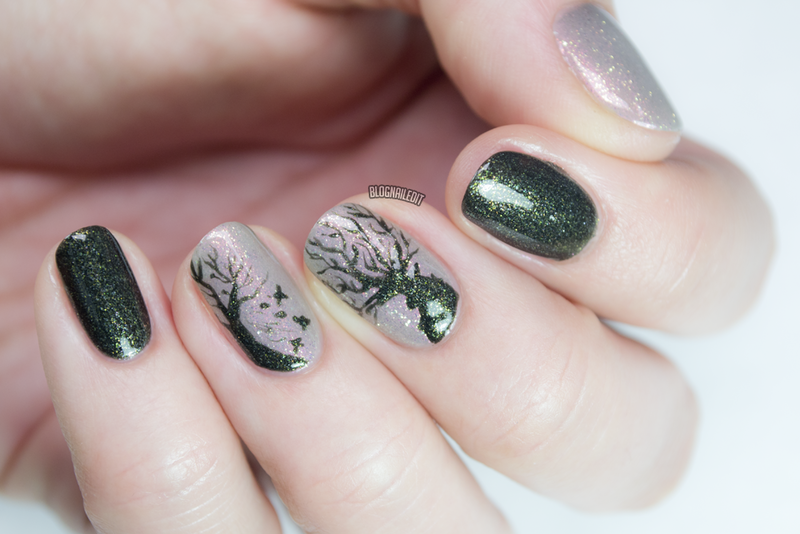 I started with a falling leaves and floral look, but as I got going, I thought my tree was looking a little more fauna than flora, so I call this look "Enchanted Forest" because the tree could be a deer, and the leaves could be birds. It's a spellbinding mystery you're welcome to solve yourself. Crown for Whatever (2 coats) could have probably been a 1-coat color, and as you can see, it dries much differently than a normal polish. The bottom swatch is NO top coat. It's completely matte! Then, when you add a top coat (top picture) the polish gains interesting dimension with gold and purple shimmer over the deep navy/purple base. 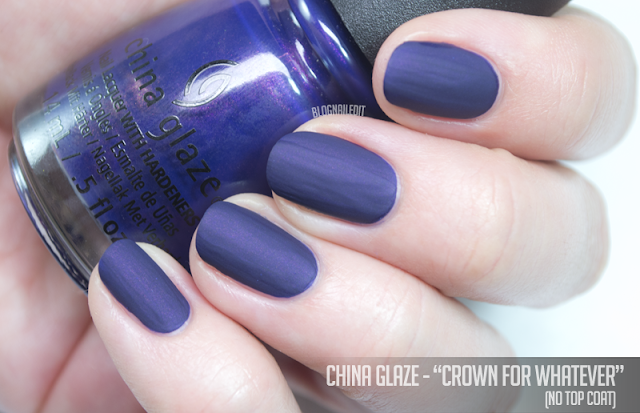 China Glaze - Do You, Boo! Do You, Boo! 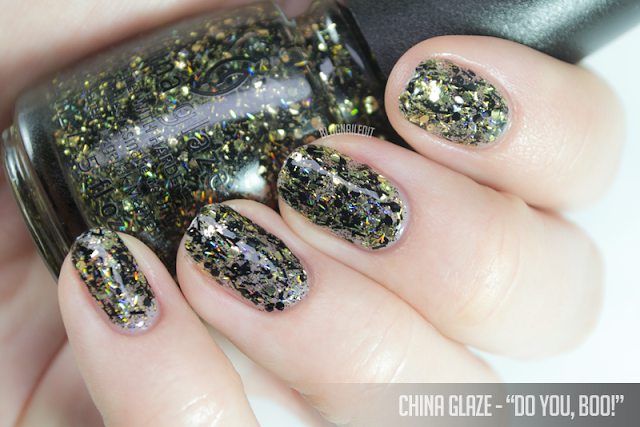 (2 thick coats) is a sheer base with black matte glitter (thick bar glitter and larger hex glitter) and gold glitter (thin bar glitter and hex glitter), plus tiny specs of both. 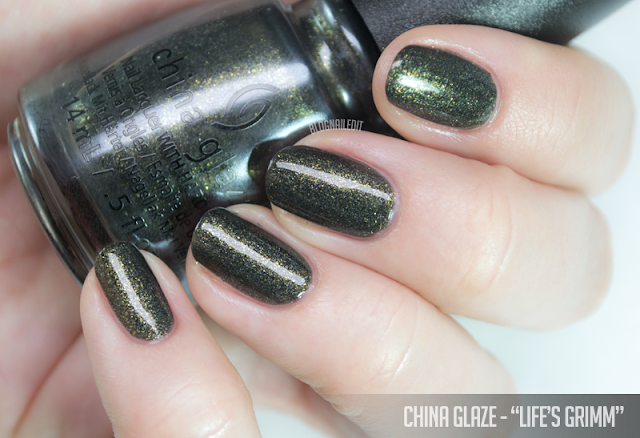 Life's Grimm (2 coats) turned out lighter than I thought it'd be after seeing it in the bottle. That's what swatches are for! Though it's a black base, the poisonous green shimmer catches the light and reflects it back. 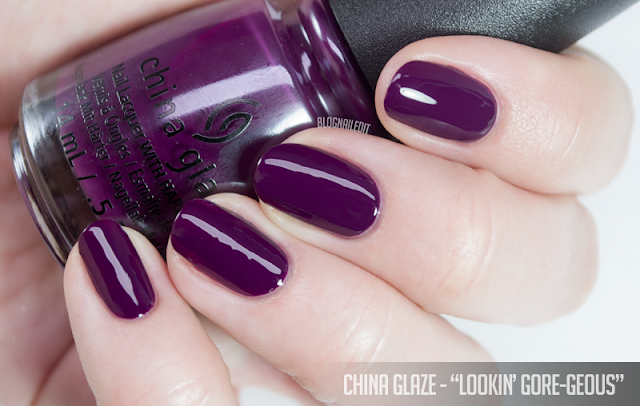 Lookin' Gore-geous (2 coats) is a lushious deep dark mulberry creme. This did not dry matte like Crown for Whatever, though it's almost as dark. China Glaze - Queen, Please! Queen, Please! 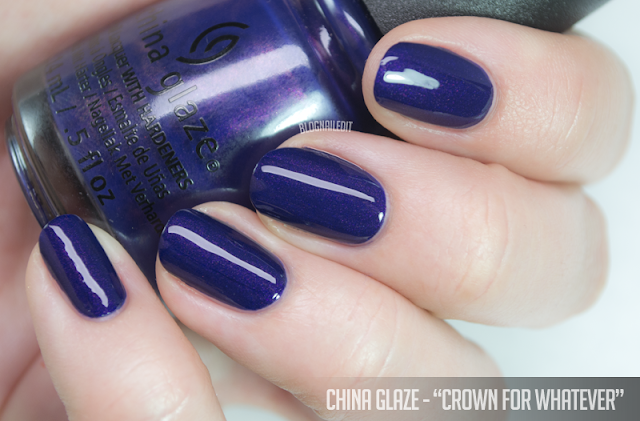 (3 coats) is a great topper option to change up any color (for example, used in my nail art on top of Sin-derella), but needs lots of layers to cover the nail underneath. I only used 3 coats for this shot, and I liked the effect. 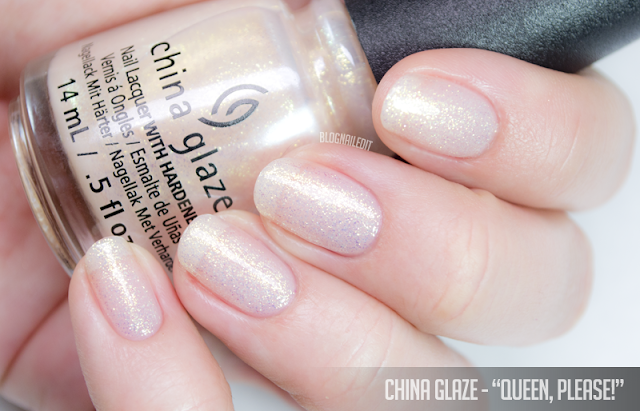 You're not really going for full coverage with a glitter polish like this. Sin-derella (2 coats) is a really interesting shade! 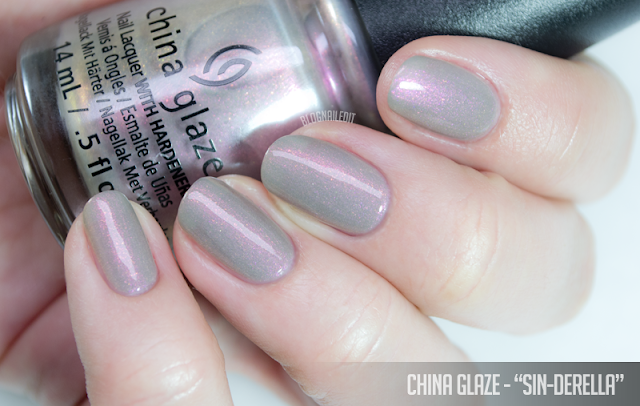 There's so much dimension, but it's almost a grey base with pink shimmer? But there's more...the pink shimmer is iridescent, so the grey/pink shifts to gold/teal in the right light. Whether you get the whole collection or not, you can't deny there's some show-stopping shades to tide you over until the China Glaze winter's collection...which I'll have up here shortly!